The Houston Chronicle is reporting that a woman crossing Westheimer near Dunvale was fatally struck by a car the afternoon of Thursday April 28, 2011. The accident happened around 2:00PM. The pedestrian was pronounced dead at the scene and the driver who struck the pedestrian waited for police. HPD said that the fatal accident remains under investigation. 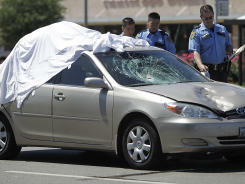 The photograph below appears to show the deceased pedestrian on the vehicle’s roof. Click2Houston.com has reported on the same incident however the Click2Houston article identifies the pedestrian as male and states the man had been shopping at Wal-Mart immediately before the accident, then he was struck when attempting to cross four lanes of traffic not at an intersection. Those of you familiar with Smith & Hassler‘s television commercials will know that for many years actor William Shatner has been Smith & Hassler‘s spokesperson. William Shatner has enjoyed a very long and fruitful career but is probably best known for his role as Captain James T. Kirk of the starship U.S.S. Enterprise, boldly going where no man had gone before in the TV show Star Trek. Shatner played the role of Capt. Kirk from 1966 to 1969. More recently Shatner has played the role of attorney Denny Crane in the TV series Boston Legal. Shatner was born in Montreal, Quebec, Canada on March 22, 1931 making today his 80th birthday. Smith & Hassler wishes Mr. Shatner a happy birthday, and here’s to many more. A law took effect in the City of Tomball, Texas today that prohibits texting while driving. The law is Ordinance 2010-25. The obvious goal of the ordinance is to avoid car accidents and to promote drive safety. Tomball police are hoping motorists voluntarily comply with the ordinance, and anticipate having to enforce it through fines and other measures in egregious cases. Certainly Smith & Hassler applauds any such efforts to reduce the number of injuries caused by inattentive drivers on Texas roads. Bellaire police are reporting a wreck on the West Loop near Evergreen Street at about 11:00pm. The collision was shortly after the Houston Texan’s game ended Thursday night and caused a two-mile backup of traffic. Two vehicles were involved in the collision and two injured people were taken to Ben Taub Hospital — the extent of their injuries has not been released. The cause for the collision is under investigation. Click2Houston.com story here.